You must have enough bone to support the implant. An xray will enable your doctor in Israel to give a preliminary opinion, but to be sure, and to plan the placement of the implant, a CT scan will also be done. When there is not enough bone you will need bone grafting. Lower jaw implants do not usually require bone grafting, but upper molars below the sinus cavity often do. Your doctor will use the xray and CT scan to formulate a treatment plan. 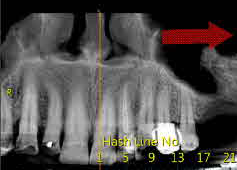 This sample xray shows the sinus cavity above the teeth on the left side top. The thickness of the jaw bone supports the teeth and prevents them protruding into the sinus cavity. Compare that with the right side, where teeth have been missing for some time and bone has been lost. The sinus cavity, which shows as black, is larger on the right and comes down lower in the xray. The bone is not thick enough to support implants. They would stick through into the sinus cavity, and because of the weakness of the jaw bone, they would easily work loose. The rightmost tooth at the top lacks support from other teeth. It will become loose because of this lack of support, migrate and develop a gap. You can see that one of the teeth on the lower left has migrated. It is leaning over so the gap is too narrow to take an implant. It is also in poor condition, with large fillings. The doctors will do a root canal here to make space so a three crown bridge can be placed over two implants and the root canal tooth. An xray allows the doctors to see what work is needed so that Tour and Smile can give you an accurate estimate of the cost. If you do not have an xray, it is not a concern. We can provide you with an estimate range, then when you arrive an xray and CT scan will be done. Once your individual treatment has been planned we can provide you with an accurate price for all of the work needed. The CT scan must be done in Israel in the format preferred by Israeli doctors, which is unlike that used in other countries. An example of a basic partial upper jaw CT scan is shown here. You can see there is much more detail than can be found in an xray. 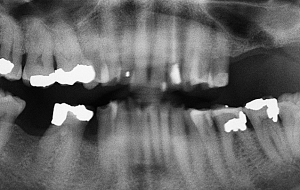 It clearly shows the loss of bone in the sinus area which will require bone grafting. A CT scan can be done in about an hour, complete with results on all of the individual teeth. The scan provides all of the information necessary to plan the detailed placement of your implants. If time allows, the implants can be done on the same day.